† is a registered trademark of Naturex, Inc.
Non-medicinal ingredients: maltodextrin, gum Arabic, silicon dioxide, sodium stearyl fumarate. Capsule: hypromellose. 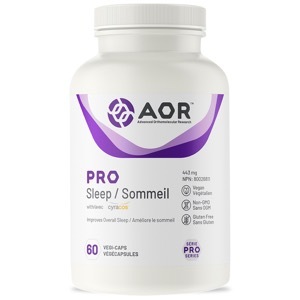 Pro Sleep is AOR's premium sleep and relaxation formula. It includes neurotransmitters such as GABA and melatonin; and 5-HTP, a serotonin precursor. The formula also includes the amino acid L-theanine, valerian root, passionflower extract, and lemon balm, all of which possess relaxing properties that increase the activity of GABA in the brain. Pro Sleep is perfect for those who have difficulty with any stage of sleep, including falling asleep, staying asleep, or feeling rested upon waking. Pro Sleep can help in cases of jet-lag, shift work, and insomnia. Many sleep formulas contain only melatonin, or may only address one aspect of sleep. As a comprehensive formula, Pro Sleep may offer a more powerful natural solution. Cautions: Caution in individuals taking carbidopa or drugs/supplements with serotonergic activity. These may include, but are not limited to, L-tryptophan, S-adenosylmethionine (SAMe), St. John's Wort, antidepressants, pain killers, cough/cold medication containing dextromethorphan, anti-nausea, anti-blood pressure and anti-migraine medication. Discontinue use and reassess if individual shows signs of weakness, oral ulcers, or abdominal pain accompanied by severe muscle pain or if experiences skin changes. Some people may experience gastrointestinal disturbances such as diarrhea, nausea, vomiting and abdominal pain as well as drowsiness. Do not use with individuals with scleroderma. Hypersensitivity (e.g. allergy) has been known to occur; in which case, discontinue use. Do not drive or use machinery for 5 hours after taking Pro Sleep. Exercise caution if engaging in activities requiring mental alertness. Do not take if trying to conceive, or taking immunosuppressive drugs. Not to be used by individuals under the age of 18 or those with a medical condition such as a hormonal disorder, diabetes, liver or kidney disease, cerebral palsy, seizure disorders, migraine, depression and or hypertension. Reassess if sleeplessness persists continuously for more than 3 weeks (chronic insomnia). Reassess if symptoms persist or worsen. Consumption with alcohol, other medications or health products with sedative properties is not recommended.